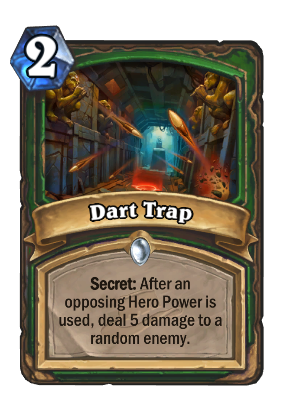 What kind of dart trap only fires one dart? This should have been the flavor text. Yeah the animation should have been a burst of 5 darts. I agree, I have not seen this card since I pwned Heroic Skelesaurus Hex. When I first tried this card I really did not like it, but it has grown on me. Against aggro decks it will tend to hit some 2/1 and be a big nothing, but against control you can often set up situations in which you can be pretty sure you will hit face. Earlier got a priest to use turn two healing one damage and taking five, felt good. Pretty good against handlock for early and good against other classes in late game when people are in top deck mode. At first I thought this card is kinda trash. But now I think this might have some potential in Face Hunter... again maybe. Possible 2v2 play mode leaked in card text!!! Please noticed how the card reads: "Secret: when AN OPPOSING Hero Power is used...". This definitely means, that if you are facing 2 players in a 2v2 play mode, the trap would trigger if either of them uses thier Hero Power! Does anyone agree? It's already stated that they're going to add 2v2 but they're not sure when. Though this could mean they're planning on implementing it soon. Oh yea. Also, notice on how a lot of cards past the classic set it will say "each" instead of "both"
How else would you word it to have it make sense? "When an enemy hero power is used..." conveys the same thing. "When your enemy uses his/her hero power" is too long and wordy. "When a hero power is used" refers to both your enemy and yours, so doesn't make sense. There are only so many ways to say it, so it doesn't have to have anything to do with 2v2... it's just how it sounds best. All cards that said "both" have been changed to "each" at this point. The only exception being the Elite Tauren Chieftan. If I remember correctly though Coldlight Oracle used to read "both" instead of "each." To give one example. But like I said, it's already been stated that they DO plan on implementing 2v2. Actually, it's already been said they're going to add 2v2. They're not quite sure when. The card COULD'VE read, "When THE enemy hero power is used..." but since they don't feel like changing the wording on anymore cards they just put it as "an" so when they do add 2v2 they won't have to do a mass rewrite on cards.